Beyond IAQ - AHR Expo Report - Pure Air Control Services Inc. This year Pure Air Control Services brought their innovative Indoor Air Quality and HVAC solutions to the IAQA Pavilion at the AHR Expo January 14-16. 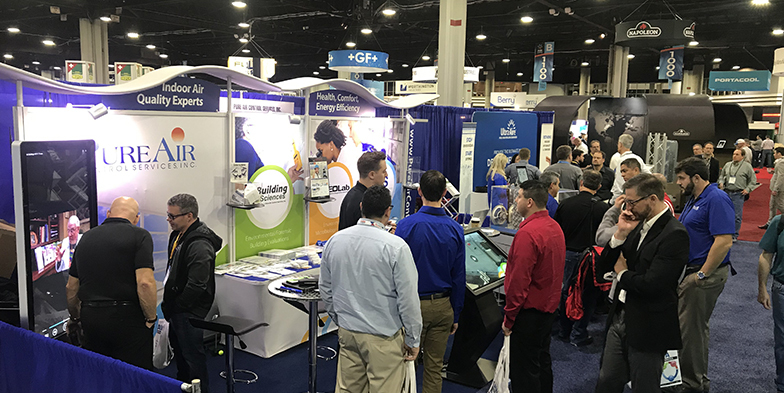 The 2019 Expo was hosted at the Georgia World Congress Center in Atlanta where over 70,000 professionals rubbed elbows to get a pulse on the HVAC industry. Along with the AHR Expo the Indoor Air Quality Association (IAQA) had their annual meeting at the Marquis Marriott. Literally the town was buzzing with interest in the latest HVAC, plumbing and refrigeration technologies. The world’s largest IAQ/HVAC marketplace was the perfect venue to showcase Pure Air Control Services environmental testing and hygienic restoration methods as well as providing the stage to launch their new real-time indoor environmental monitoring program. Our booth featured new interactive kiosks that helped attendees navigate the many solutions we provide. Guests easily accessed videos, web content, brochures and a live demonstration of our new IAQ Guard remote monitoring platform. There was certainly a lot to take throughout the IAQ Pavilion and the expo at large. It was great seeing our peers, colleagues and clients along with many new faces. The two educational presentations we taught on Legionella and Steam Coil Cleaning at the IAQA Meeting were well attended and received. This brief recap will focus on the trends and challenges for the IAQ/HVAC industries in the coming year with our solutions in key areas. Both growth and competition are up in 2019. Compared to just three years ago there are many more opportunities today in the IAQ/HVAC industry. Consider that in 2015 the industry was worth a respectable $81.1 billion. It has since grown every year to top $130.7 billion through 2018! Of course, much of that growth was in new construction which still continues as the largest projected driver of new business in 2019 according to the 2019 AHR Economic Outlook Survey. This is a shift from previous years where maintenance and replacements were the lead drivers. Realizing these this trend we are dedicated to supporting new construction with our accredited Building Sciences division for commissioning, HVAC hygiene evaluations and IAQ/IEQ Testing. At the same time, as an IAQ based company we are committed to ensuring high levels of maintenance services, both predictive and preventative, for building health, occupant comfort, and energy efficiency in existing infrastructure. Let’s look a few key solutions for these market needs. Building automation systems (BAS) and other internet of things (IOT) technologies predictably continue to be rising stars I the industry. Realizing this need, Pure Air Control Services launched their new IAQ Guard Real-Time Monitoring program. This service provides 24/7 remote IAQ data collection. A series of sensors are placed throughout a building that continuously take readings and upload them to a cloud platform. The data is then aggregated into a browser based application for viewing and reporting. This service can be helpful to new construction, especially LEED and WELL buildings, to continuously monitor for compliance. It is also useful for ongoing IAQ investigations and post remediation monitoring. Should a downward trend in conditions be noticed, corrective action can be taken before the issue escalates. Eventually, this type of program will be integrated in the BAS for automated corrections. Whether you are operating in a newly constructed building or are responsible for maintaining existing facilities HVAC system cleanliness and energy efficiency are ongoing areas of concern. Even the latest, most energy efficient, systems get dirty and have to work longer to maintain optimal cooling. Not to mention when new systems are put in use before construction is even concluded. Pure Air Control Services provided testing and specialized remedial solutions for both new and existing buildings. Building Health Check testing and HVAC Hygiene Assessments identify problems with the systems that can lead to problems for occupants, equipment and energy efficiency. Once the type issue has been reported it can be handled with a combination of our revolutionary IAQ focused building and HVAC services. PURE-Duct hygienic cleaning gets rid of dust and microbes from the air conveyance system. It utilizes specialized containment protocols, HEPA filtered negative pressure machines and NADCA trained staff to ensure a healthy outcome for the building. PURE-Steam AHU/Coil cleaning is a proprietary method that blasts fouling from deep within the coils and crevices of an AHU. It uses high temperature and low pressure steam along with a high volume flush to get the job done. Pre and post cleaning M&V testing demonstrates big improvements in Airflow, Pressure Differential and Temperate Differential that equates to huge performance gains. The high temperature steam is also 99% effective in killing microbes like bacteria and fungi for better IAQ. PURE-Decon is a dry fogging system that deploys a fine hydrogen peroxide and silver mist into a room to disinfect it. This is especially useful in high risk environments such as healthcare facilities and educational institutions. While new construction might be on the rise many facilities are still struggling to get out from under deferred maintenance budgets. This is especially true in K-12 schools and governmental institutions. Often times there is no money for new construction or even HVAC system replacements. This where Pure Air Control Services comes in. Our HVAC New Life service is a valuable and viable option for those looking to extend the useful life of their equipment. HVAC New Life effectively restores an AHU with a combination of PURE-Steam hygienic cleaning, PURE-Coat refinishing, PURE-Liner 2.0 drain pan restoration, and PURE-Cell non-fiberglass insulation replacement. Units restored with HVAC New Life can be recapitalized, have a 5 year limited warranty and be brought back to near factory operating specifications. We have seen that HVAC New Life can cost as little as 1/10 the cost of new. It is sustainable in that, units are restored in place. This means there is no need to transport new units to the site and transport old units to scrap heap. This is less downtime and disruption too! Even though many think of HVAC New Life as only for aging equipment it can be used for new units too. This is especially true for outside units or equipment that will be operating in harsh climates. Most factory new equipment only has minimal paint or is just bare metal. HVAC New Life can be used for new construction to protect the investment from the elements and ensure many extra years of service. The AHR Expo is an exciting time to view a state of the industry snapshot in a given year. It’s fun to compare experiences and trends year after year. While change is inevitable, so to is Pure Air Control Services’ commitment to stay agile and meet the needs of the ever evolving IAQ/HVAC industry. To schedule a complimentary consultation about our innovative indoor air quality focused building and HVAC services please call 1-800-422-7873 or contact us via this website.